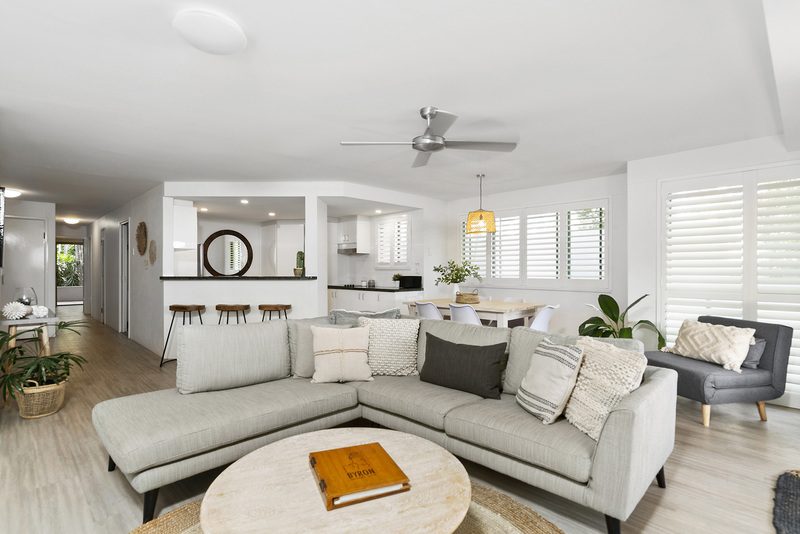 Thanks to its enviable location opposite Clarkes Beach, you’ll enjoy this ocean glimpses and fresh sea breezes from this recently renovated and styled ground floor Byron Bay apartment. The covered front garden courtyard is a relaxing outdoor space to retreat after a long day spent surfing or sunbathing at the beach. Inside is a light, bright, open-plan living room, kitchen, and dining room, along with 3 spacious bedrooms and 2 modern bathrooms. 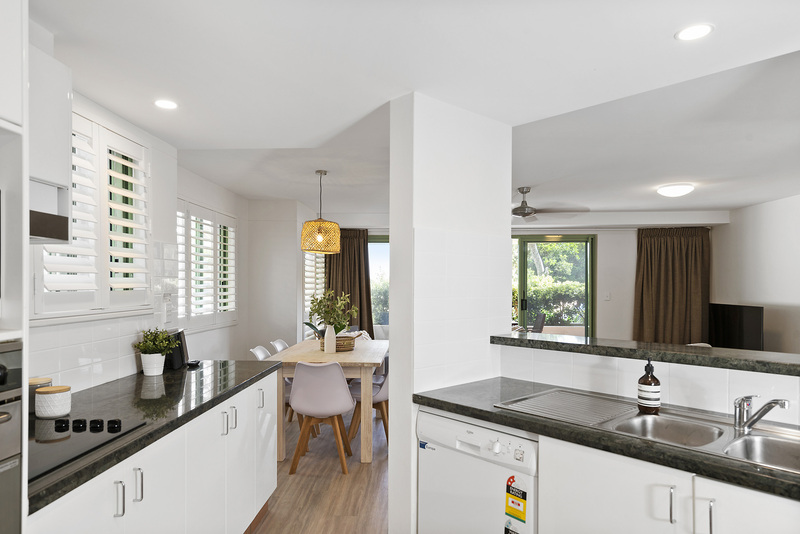 Families will love this space for their next beachside holiday in Byron Bay! Settle into the enormous sectional sofa and switch on your huge flatscreen TV. With a bowl of fresh popcorn in hand, you have all the trappings of a family movie night! Large, sliding glass doors flood the open-concept living space with lots of natural light while connecting the room to the rear patio. 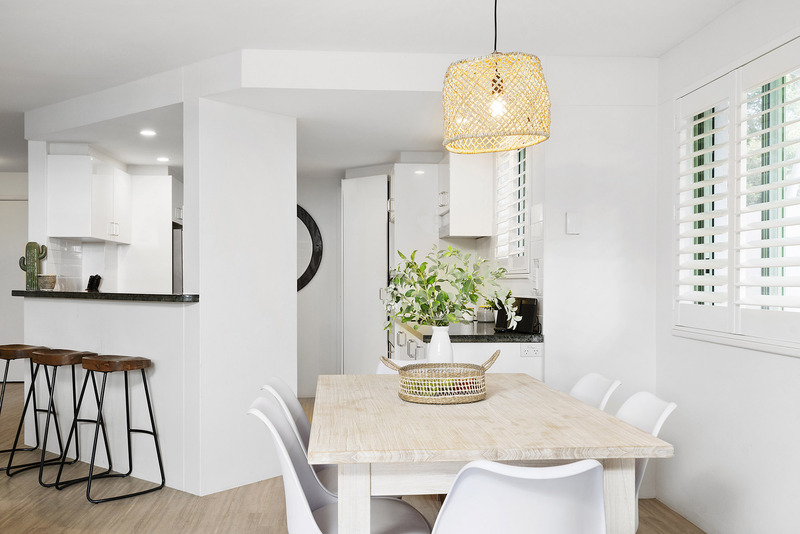 Completing the layout is a dining area with space for 6 to tuck into your latest culinary creation. Speaking of culinary creations, the chef in your family will adore this bright and well-appointed kitchen. 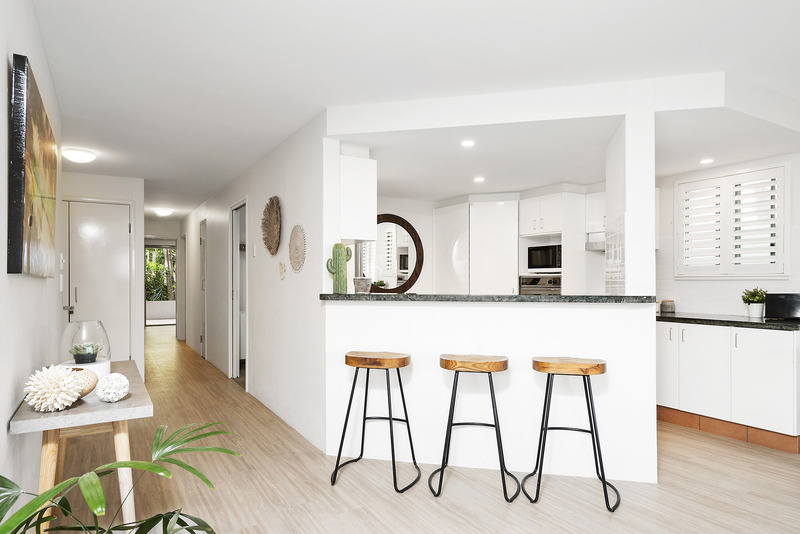 The breakfast counter with three stools overlooks the open living space, creating a welcoming spot to enjoy your morning brew or simply serve dinner buffet-style. 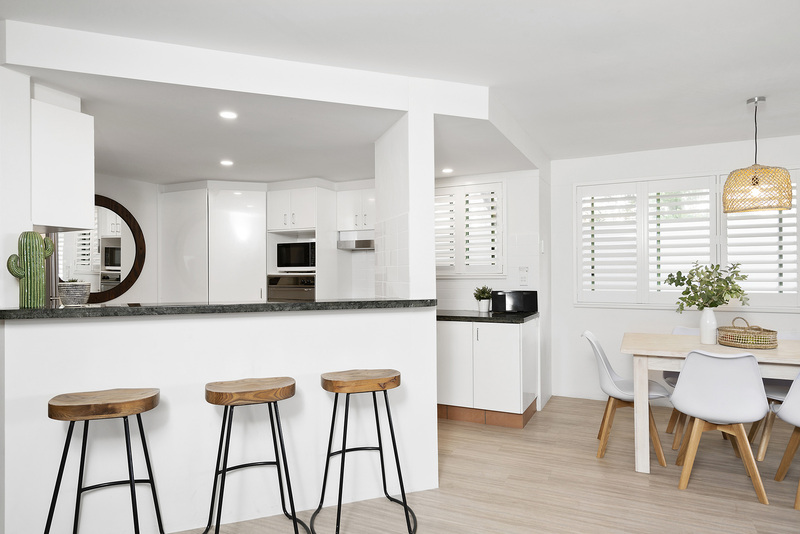 Sleek white cabinetry is offset by bold black countertops, creating a stylish space with everything you need for prepping, cooking, serving, and clean up. Bon appetit! 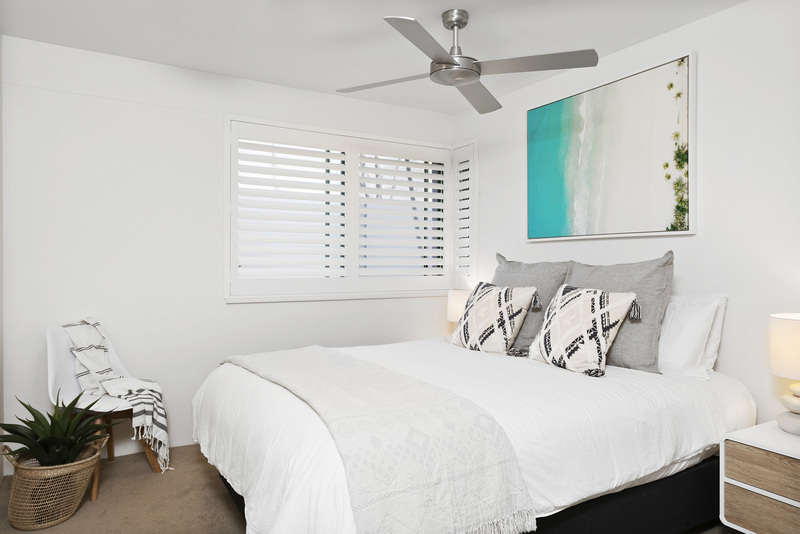 When you’re ready to rest your weary head after a long day exploring Byron Bay, Apartment 1 Surfside has three welcoming bedrooms to whisk you off to sleep. In the master, you’ll find a large king bed, ceiling fan, flatscreen TV, and patio access, along with your own ensuite bathroom. Two other bedrooms are smartly fit with a queen bed and two single beds, both also with ceiling fans. With a second shared bathroom in the hallway, the apartment is perfectly set up for a family travelling with kids. A fold out bed, suitable for a child, is available on request. 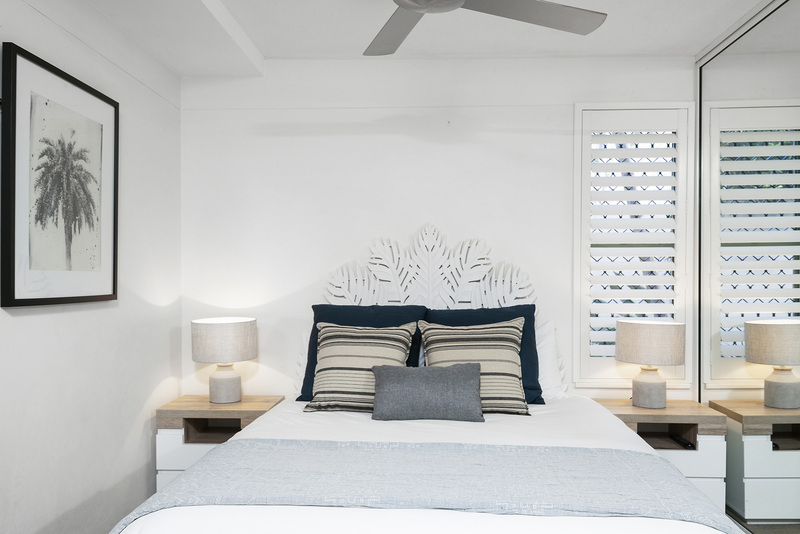 Crisp and clean, the two bathrooms at Apartment 1 Surfside are family-ready with lots of counter space and storage. The master has its own private ensuite while the shared hallway bathroom includes a tub, perfect for small kids. When staying at Apartment 1 Surfside, dining al fresco is a must. The covered front garden courtyard is complete with a large dining table for 6 and a Weber BBQ for grilling up something delicious. 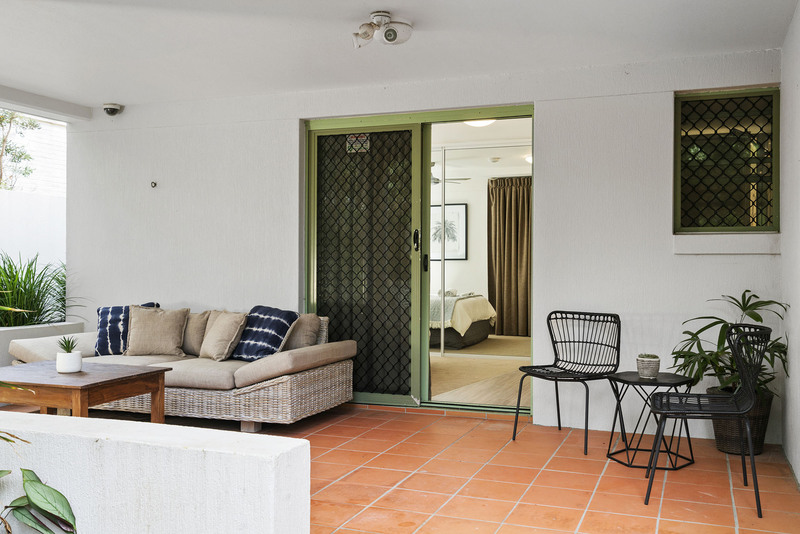 Enjoy the abundant Byron sunshine and sea breezes here, or retreat around back to the rear patio for a bit more protection from the elements. There is space for 1 car to park in the building’s secure, underground parking complex. 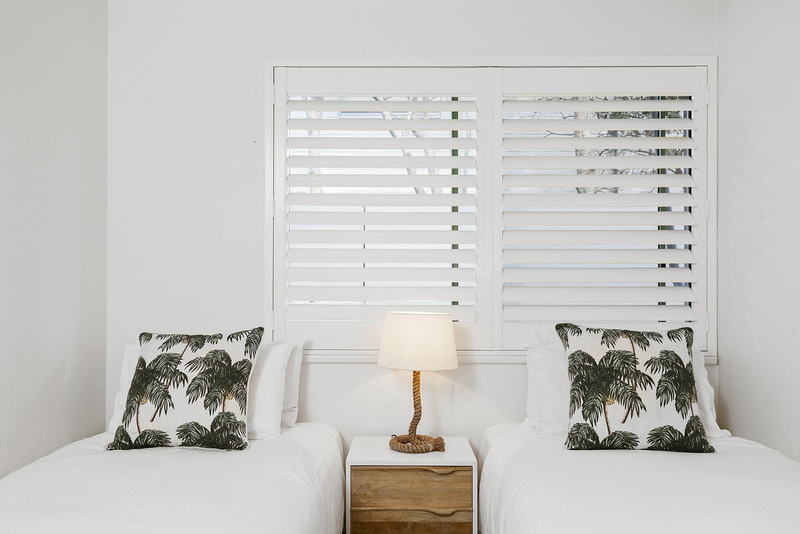 In Byron Bay, it simply doesn’t get better than a Lawson Street location. 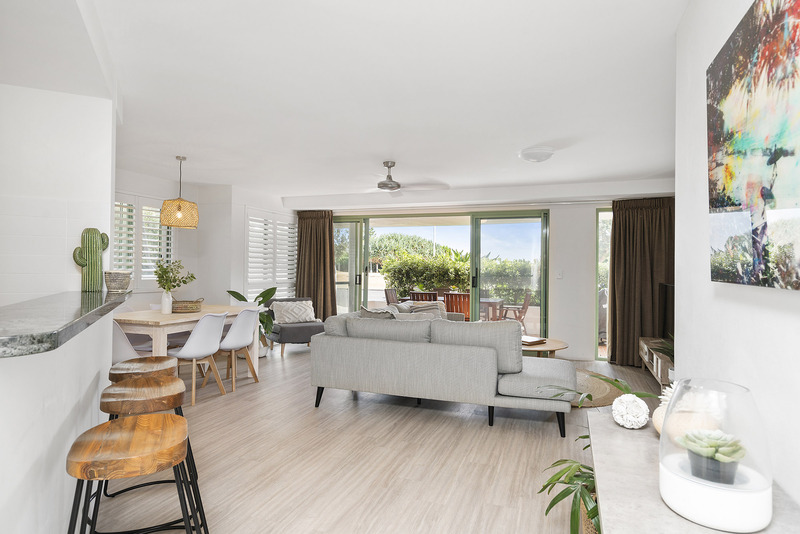 This desirable address is just over the road from the stunning white sands of Clarkes Beach, and only a five-minute walk straight into the heart of the CBD. 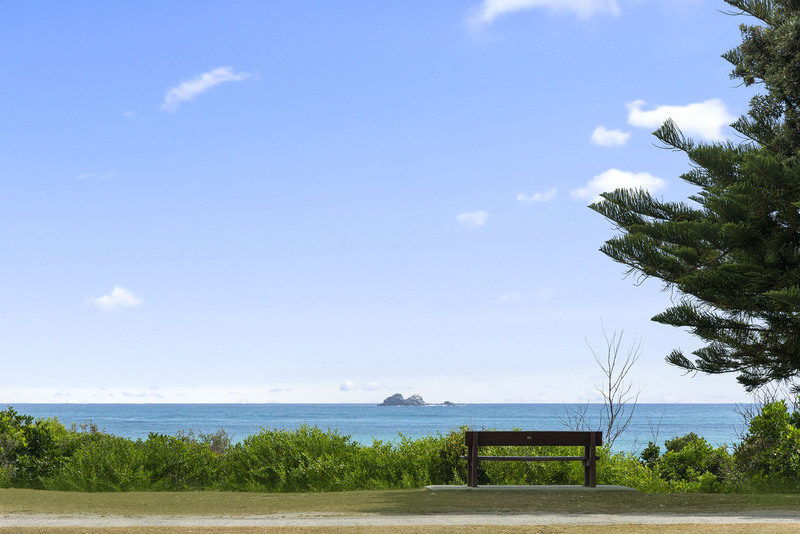 Enjoy a longer walk around the Cape Byron Lighthouse loop, and return past The Beach cafe for a nice hot coffee. 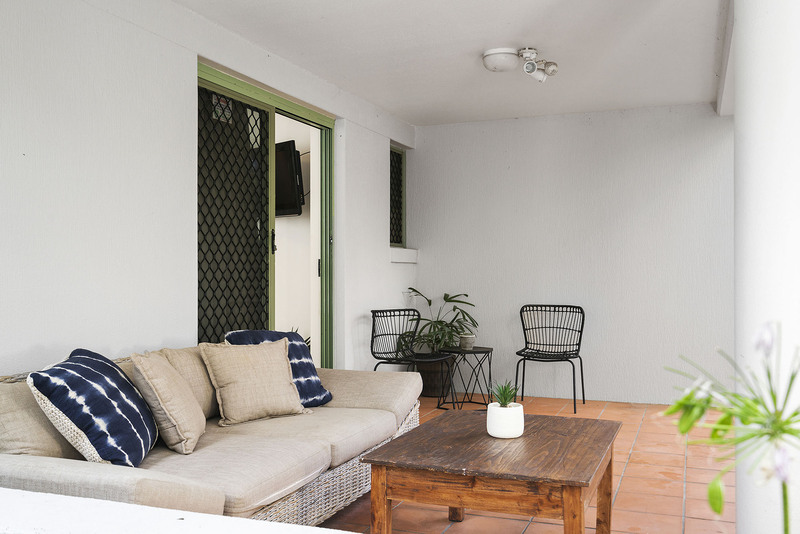 You’ll easily enjoy the very best of Byron here, with exciting restaurants, stylish boutiques, scenic nature trails, alluring spas, and much more, all within easy reach. Everything was ABSOLUTELY amazing!!! 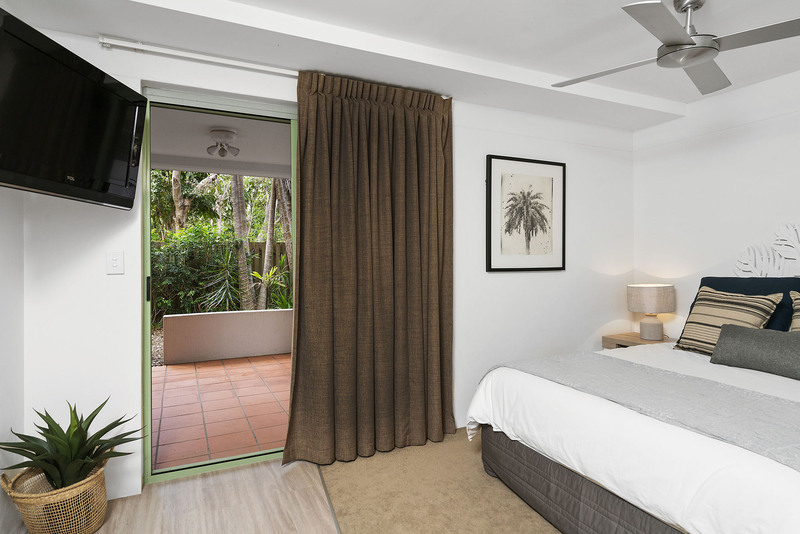 The location, the large apartment and space, the cleanliness, and everything provided (kitchen utensils, cleaning/laundry products, plenty of beach towels). But the only downfall was no air-con and the internet didn't work. 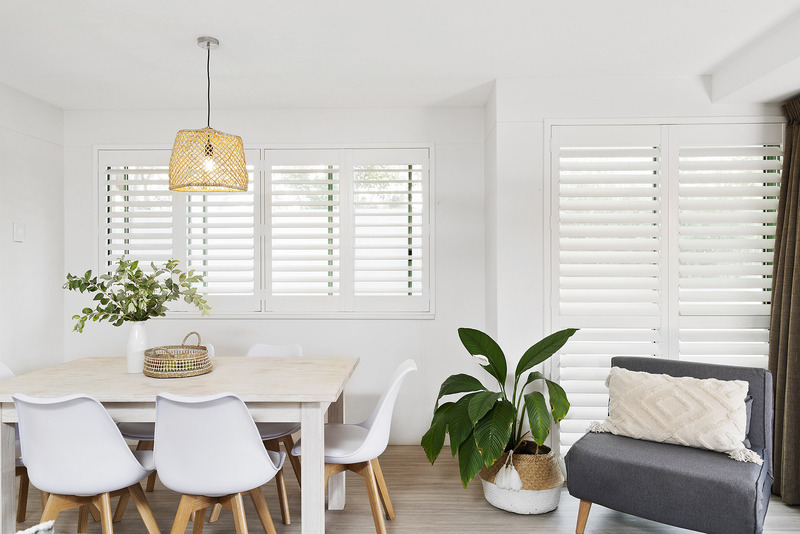 We knew it wouldn't have air-con after reading other reviews, and the ceiling fans and breeze worked to keep air circulating. But air-con would have just been the cherry on the cake! It's so hot and humid so many months of the year in Byron, so it does make a holiday a bit more relaxing when you can cool off after a day at the beach! But other than that the apartment was EXCELLENT. And we had the best holiday!!! 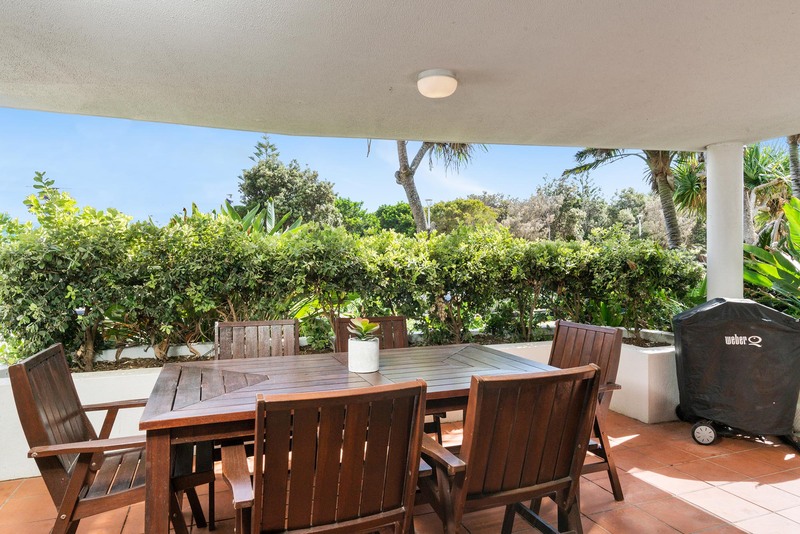 Loved the location and proximity to the beach, town centre, restaurants and walking tracks. It was an easy walking distance to our family members who were staying close by. The WiFi was appreciated and operated well. The location was excellent and being the ground floor it was easy to access. The other tenants and guests that we bumped into were very friendly and pleasant. The location of our accommodation made it so easy to get around with young kids. We enjoyed eating out, snorkelling, surfing, visiting family, the farm and the lighthouse walk.